Promotional items are not available separately before January 18. After January 18, the products will be featured in the Spring-Summer 2009 Idea Book & Catalog and available for purchase individually, but not at a discount (unless purchased using the promotional bundle item number). 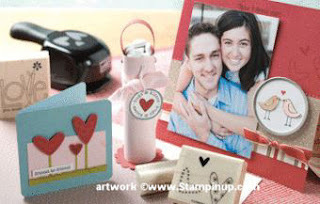 Hostesses who hold a $150 workshop or more will qualify to use their hostess free dollars for the Love You Much Bundle. You can email me to place your orders - or shop 24/7 via my website.